Margot Atwell, ex-publisher of Beaufort Books, discusses the appeal of Rollerderby and her efforts to publish a book about the sport via Kickstarter. A few years after I moved to New York and got a job in the book publishing industry, I discovered a great outlet for my extra energy and limited free time: the campy underground sport of roller derby. Roller derby is a full-contact competitive sport in which skaters wearing quad roller skates zip around an oval track, hitting each other and jockeying for position to score points and prevent their opponents from scoring. The sport began in the 1930s and became very popular in the 1950s and 60s before dying out in the 1970s. It was reinvented in 2001 in Austin, Texas, as an all-women’s contact sport with real rules and real athletic competition. The men’s version didn’t come until later, with the first full-length modern men’s derby bout taking place in 2007. 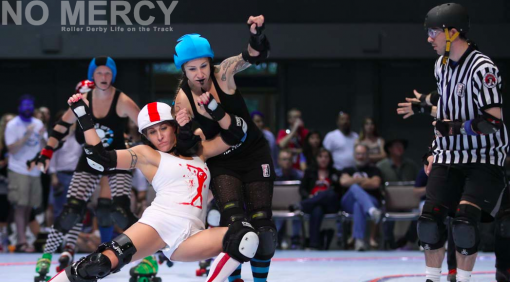 Modern roller derby is a funny mix of real athleticism and theatricality, a nod to the showy roots of the sport. Participants can create an alter ego—someone who can be tough and aggressive and hit people (legally!) without apology. 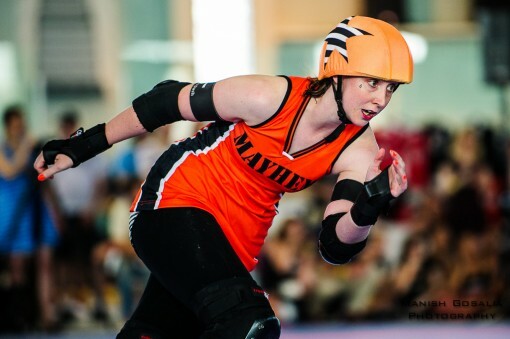 Skaters even choose their own derby name—a new moniker that frequently involves a pun or cultural reference. Mine is “Em Dash,” a favorite with the copy editors and graphic designers who attend our bouts. Playing roller derby was a great counterpoint to the more cerebral work of publishing—a way to force myself to be completely in the moment and leave my workday behind. As I improved, I found myself becoming more involved in what I had originally thought was just a fun hobby. I began doing more work off the track, too. The modern amateur sport was founded with a DIY approach to everything, so in addition to practicing and playing in bouts, skaters also do the work of running leagues, producing bouts, promoting, raising money, creating and selling merch, and many other tasks. Unable to escape my publishing roots, in 2011, I started Derbylife.com. The website was meant to be a gathering place for the roller derby community: a website where skaters, refs, and others involved in the sport can share advice and stories with each other. Over time, I discovered that there were quite a few other publishing people and literary types involved in the sport, such as Hela Skelter, Mani-Ax, Pain Eyre, and Harm’s Way. Even among those who don’t work in publishing, there are some great literary names such as Beatrix Slaughter, Lemony Kickit, and Charlotte Bupowski. After years of running and writing for Derbylife.com, I started to think about writing a book about the sport. Mani-Ax, my agent friend at Red Sofa Literary, who represented Jules “Axle Adams” Doyle’s beautiful derby photo book, No Mercy, asked if I was going to send the manuscript to her. But, perhaps inspired by the DIY nature of roller derby itself, I resolved to start my own company and publish it myself. I decided to try to raise money with Kickstarter to produce and print the book. I created a modest budget that would allow me to license a cover image, hire a good copy editor, and cover the other expenses of publishing a book well. The Kickstarter project for Derby Life: Stories, Advice & Wisdom from the Roller Derby World launched on September 24th, and it will run through October 24th. So far, it has been a crash course in book marketing—similar to a normal book PR campaign, but sped up, with a ticking clock urging me to promote faster. I’m constantly testing out new ideas and trying to figure out different ways to get my message out in an interesting way. Kickstarter is an all-or-nothing funding platform, which can be a great motivator for backers to spread the word to make sure a project happens, but it also means that if I don’t hit my goal by October 24th, nobody’s credit card will be charged and I won’t get to make my book. I have been amazed at the response so far, and the incredible generosity of those in my community—contributing time, expertise, images, and signal boosting to help me reach my goal. Before I launched the project, I wasn’t sure whether the roller derby world really wanted a print book, but I feel much more confident now that there’s actually real demand for the project. The jury is still out, but I feel confident that if people want to read this book, I’ll hit the goal I set. I’m starting to look forward to the next challenge—finishing and publishing the book. Margot Atwell is the Publishing Community Manager at Kickstarter. Previously, she served as Publisher of Beaufort Books, an independent publisher of fiction and non-fiction. Under her leadership, Beaufort published four national bestsellers, including Hide!!! by Jeff Foxworthy, If I Did It by the Goldman Family, and a new edition of I’m Dancing As Fast as I Can by Barbara Gordon, along with many award-winning books. Her first book, The Insider’s Guide to Book Publishing Success, was published in February 2013.